We inventory a complete line of pop rivets, blind rivets structural rivets and related rivet tools / riveters. Popular items include stainless steel rivets, aluminum rivets, large head rivets, copper / brass rivets, closed end rivets and more. We also have Gesipa specialty rivets like Bulb-Tite, Extra-Length metric rivets, Mega-Grip rivets, Poly-Grip rivets and painted rivets (to match most roofing/siding panels). Our rivets are made by the industries leading suppliers and have the finest quality. We'll drop ship your order anywhere. Email us for our special OEM volume pricing. 1. Rivet shear and tensile strength: The rivet selected and the number of rivets used in the application should equal or exceed the joint strength requirements. Typical ultimate shear and tensile strengths are listed in the catalog. Testing is recommended before final rivet selection and use in your product. 2. Rivet body material: Should be compatible with the materials to be joined to resist galvanic corrosion which may result in reduction of joint strength. If dissimilar materials are widely separated on the galvanic chart, it is advisable to separate them with a dielectric material such as paint or other coating. 3. Rivet Grip Range: Select the rivet grip range which includes the total thickness of materials to be joined. Please note that the rivet barrel length is not the grip range. 4. Rivet Hole Size: Recommended hole sizes are listed for each rivet. An undersize hole will not allow insertion of the rivet body; an oversize hole will reduce shear and tensile strengths, and may cause improper rivet setting, all of which promote joint failure. 5. Rivet Head Style: Various head types are offered to accommodate different assembly needs. The most popular is the buttonhead, whose lower-profile head is twice the diameter of the rivet body. This provides adequate bearing surface for nearly all applications. The large flange rivet provides greater bearing surface for fastening soft or brittle facing materials. The countersunk rivet is available for applications where a flush appearance is required. And the closed-end is ideal for roofing, marine, electric or electronics applications. Blind Rivets (open or closed end): The are are used for blind fastening where there is no access to the opposite side of the work. Bulb-Tite Rivets Shown above. The Bulb-Tite rivet body folds into three separate legs forming a large blind-side head. This large bearing head evenly distributes the Bulb-Tite's clamp force in soft, thin or brittle materials while providing high pull-through resistance. The Bulb-tite's wide grip range enables a single Bulb-Tite to work in a greater variation of thicknesses. Buttonhead Rivets (open end, blind / pop rivets / break-stem rivets). The are are used for blind fastening where there is no access to the opposite side of the work. These have a low profile head diameter which is about twice the rivet body diameter, providing adequate bearing surface. Closed End Rivets: These are moisture resistant due to the closed end and tight seal. They also have greater shear strength. Sizes are 1/8 to1/4" diameter. Extra-Long / Metric Rivets We provide metric blind rivets according to DIN7337 standards in 3mm, 4mm and 5mm diameters. Standard material is Aluminum/Steel. Stainless Steel 304 and 316 alloys are available upon special request. All dimensions for Metric Series are given in millimeters. Additional diameters of 4.8mm, 6mm and 6.4mm available on special request. Large Flange Rivets provide greater bearing surface for fastening soft and brittle facing materials and oversize facing holes. Multi-Grip Rivets have extended grip range capacity. They reduce the inventory of sizes needed to keep on hand. 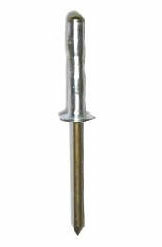 Mega-Grip Rivets The Mega-Grip rivet is a high strength structural blind rivet offering several advantages over conventional blind rivets. Mega-Grip's wide grip range enables a single Mega-Grip to replace up to five different lengths of standard rivets. High shear strength is achieved by Mega-Grip's flush break self plugging mandrel. Mega-Grip rivets are hole-filling, resulting in tighter joints and improved sealing for weather resistance. Mega-Grip rivets are installed via standard rivet tools and do not require special nose tips. Multi Grip Rivets rivets have a wider grip range than standard blind rivets and several other advantages. The "bulbing" action of a multigrip blind rivet ensures complete hole fill even in oversized, irregular or misaligned holes, provides high clamp-up and high shear strength and ensures positive stem (mandrel) retention, plugging the end of the rivet body and providing a vibration and weather-proof seal. Due to the Multi-Grip blind rivets extended grip range capacity, Multi Grip Rivets reduce the inventory of sizes needed to keep on hand. We stock aluminum-steel Multi grip rivets. PolyGrip multi-grip rivets feature a wide grip range, enabling a single PolyGrip to replace up to three different lengths of standard blind rivets. PolyGrip rivets expand radially, filling the application hole, resulting in tighter joints and improved sealing. The PolyGrip's locked mandrel core creates a weather resistant fastener. Improved material support is provided by the PolyGrip's larger blindside head formation. Large flange head style available upon request. Open End Rivets: These are the standard design and are available in a wide variety of sizes and materials, for most any application. Plastic Rivets: Precision Molded, all nylon. Secure lock feature prevents pull-out. Used for fastening plastic to plastic, plastic to metal or fiberglass. Peel Rivets: These form a large curled underside connection (banana peel). They are used in metal roofing and to adhere where backside access is not possible and a larger clamping surface is needed. Rivet Materials: The rivet body alloy, in addition to being chosen for strength requirements, should also be selected for compatibility with the materials to be joined to avoid galvanic corrosion caused by coupling dissimilar metals. If dissimilar metals are widely separated on the galvanic chart, it is advisable to separate them with a dielectric material such as paint or other coating.